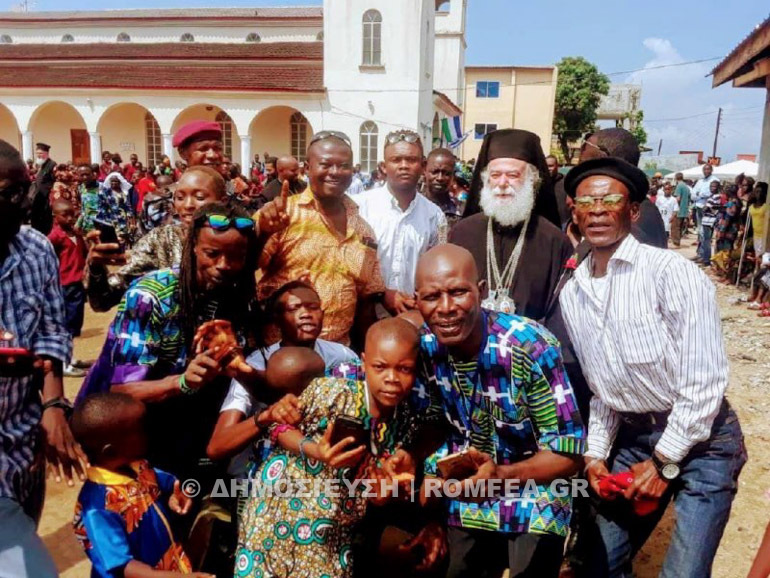 On Sunday 11th November 2018, His Beatitude Theodoros II, Pope and Patriarch of Alexandria and All Africa the Divine Liturgy at the Cathedral if St Eleftherios in the centre of the city of Freetown, in Sierra Leone. 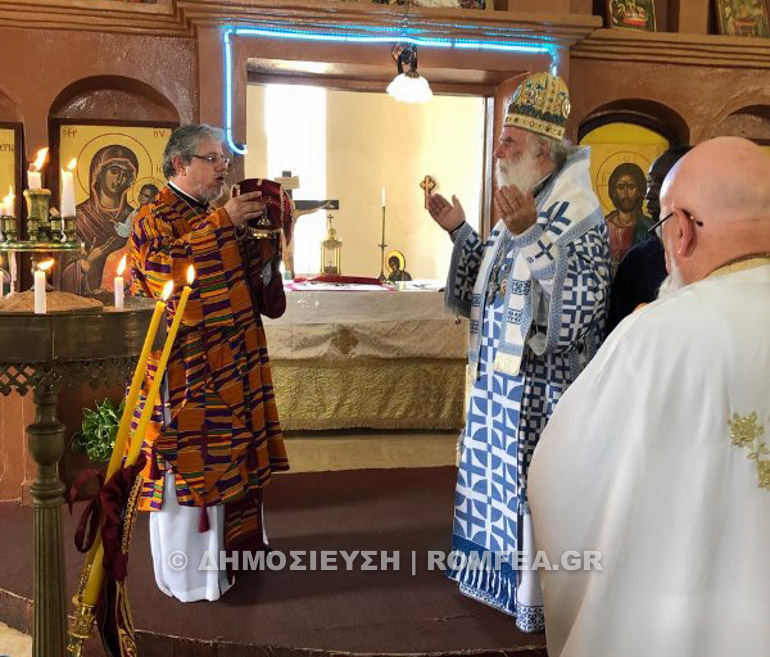 Participating in the Divine Liturgy were His Eminence George Metropolitan of Guinea, Archimandrites Themistocles Adamopoulos and Athanasios Kayembe and all the local Clergy. 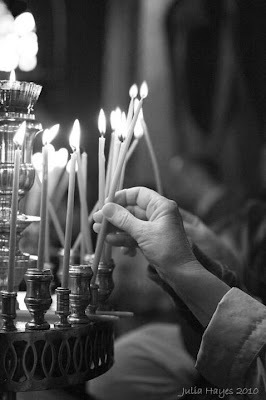 From early on hundreds of Orthodox locals, as well as the pupils of the Orthodox schools had filled the inside of the Church and the and the surrounding areas. Deeply moved, the Patriarch expressed his joy on the enormous change which he saw in the country following his last visit in 2012 and admired the progress of the Orthodox Church, particularly in the education department, stressing how important it is for the Church to support the children. 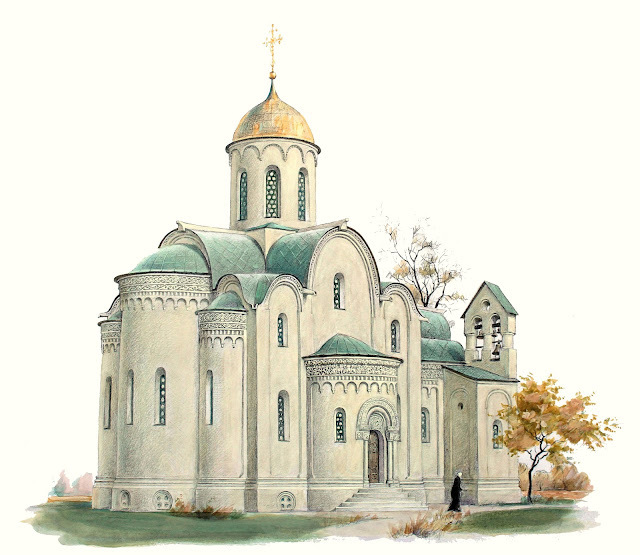 He thanked the Metropolitan, Fr. Themistocles and their colleagues for their efforts, the teacher Mrs. Mary Adams, in charge of the exceptional operation of the Orthodox Schools and the teacher Mrs. Eleni Athenodorou, in charge of all the youth programmes. He also thanked all the volunteer Missionaries present from Greece, America and Guatemala, as well as the Media Group from ERT which followed his journey through Sierra Leone. He then thanked Protopresbyter Fr. 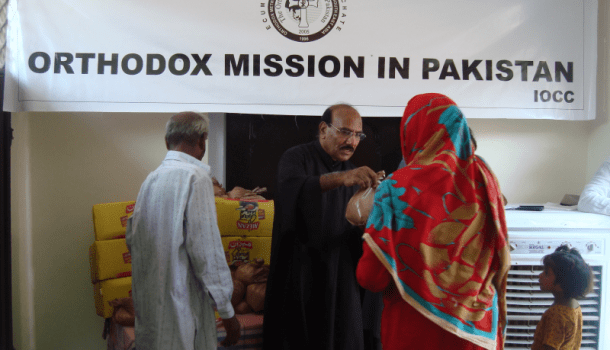 Alex Carlucco from America who supports the Mission in Sierra Leone and named him Great Benefactor of the Patriarchate and Mission. 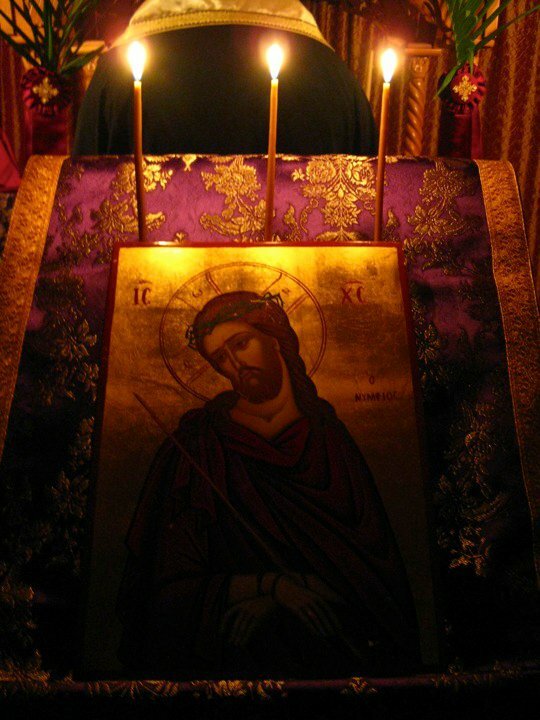 After the Divine Liturgy His Beatitude blessed the agape meal which was prepared in the grounds of the Cathedral, where food was offered to the entire congregation. In the afternoon, the Patriarch attended the youth festival in the courtyard of the Orthodox Schools in Tawer Hill. The children of all ages and the Mission choir joyfully presented a wonderful festival programme dedicated to their Patriarch. His Beatitude was particularly moved by the presentation by the choir of the blind children of the Mission. On Monday 12th November His Beatitude completed his 12-day Missionary journey to West Africa and departed for Alexandria accompanied by His Eminence George. At the airport the Patriarch was seen off by the Minister of Foreign Affairs of Sierra Leone, who thanked him once again for visiting his country and for blessing its tormented people. This entry was posted in Africa, America, Australia, England - Αγγλία, Guinée- Guinea- Γουινέα, Αφρική, Αφρική, Africa, Ευρώπη, Ελλάδα - Greece, ΗΠΑ - USA, Κύπρος - Cyprus, Καναδάς, Πατριαρχείο Αλεξανδρείας ( Greek Orthodox Patriarchate of Alexandria and all Africa ), Σιέρρα Λεόνε - Sierra Leone and tagged Christian Church, Christian Church in Siera Leone, Fr Themi Adamopoulos, Greek Orthodox Patriarchate of Alexandria and all Africa, π. Θεμιστοκλής Αδαμόπουλος, χριστιανισμός, Ορθόδοξη Εκκλησία, Ορθόδοξη Εκκλησία στη Σιέρα Λεόνε, Ορθόδοξη Ιεραποστολή, Ορθόδοξη Ιεραποστολή στη Σιέρα Λεόνε, Πρακτορείο εκκλησιαστικών ειδήσεων Ρομφαία, Πατριάρχης Αλεξανδρείας Θεόδωρος Β', Πατριαρχείο Αλεξανδρείας και πάσης Αφρικής, Σιέρα Λεόνε, Χριστιανική Εκκλησία, ιεραποστολή, mission in Siera Leone, Orhtodox Church in Siera Leone, orthodox, Orthodox mission in Siera Leone, Paradise for Kids Sierra Leone, religion in Siera Leone, romfea.gr, Siera Leone, Theodoros II Pope and Patriarch of Alexandria and All Africa. Bookmark the permalink.